"Lou Engle and key charismatic leaders believe that in 2019, God will ignite a movement in the next generation as never before. Specifically, these leaders believe Billy Graham's mantle of evangelism will be poured out on the next generation—and they have called for a gathering to usher it in. This event, called The Send, will take place Feb. 23 at Camping World Stadium in Orlando, Florida." Shawn Bolz shares on Charisma Magazine. "It is obvious that this is not just a stadium event but a movement"
It is obvious that this is not just a stadium event but a movement. Lou Engle has ended his longtime ministry, TheCall, to pursue The Send. "We believe that [Graham's] mantle is hovering, waiting for thousands to lay hold of it," Engle says. "It is a mantle that is a burden for evangelism—for a new era of Jesus the Evangelist—to manifest a new Jesus People movement harvest to take place. I believe The Send will be a flashpoint for the fulfillment of that word. I so believe in this shift that I have ended TheCall." The Send's organizers are releasing their motto and asking many missions ministries, evangelism groups, and churches across North America and even other continents to convey the same message: It's time to carry out the Great Commission and show the world Jesus the Evangelist. The journey Engle has been to get to 'the send' is long but it was something long foretold. It started seven years ago when two YWAM leader (Andy Byrd and Brian Brennt) came into Engles house and prophesied a shift to TheCall. They shared prophetically how TheCall was going to become a new movement: The Send. They went on with the prophecy and shared that "Billy Graham's mantle or ability to reach people would be released on many individuals and ministries, and that people would begin to adopt their neighborhoods, schools and cities with the same faith Graham had for winning souls." They compared this with the story of Elisha and Elijah where Elisha receives Elijah's mantle, and so Graham's mantle of evangelism would be passed down to a new generation. "Graham's mantle of evangelism would be passed down to a new generation." Engle throughout the years had many confirmations and encounters on this prophecy but it was not until just before Billy Graham passed away he understood how serious God was. Engle said: "It was like a command shot right into my spirit, with the Lord saying, 'Bring me a new bowl!'" Engle says. "God went on to say: 'Whereas before you have seen stadiums filled with fasting and prayer, you are going to see bowls filled with the manifestation of the scroll of Jesus: "The Spirit of the Lord is upon me because the Lord has anointed me to bring good news to the afflicted.'" 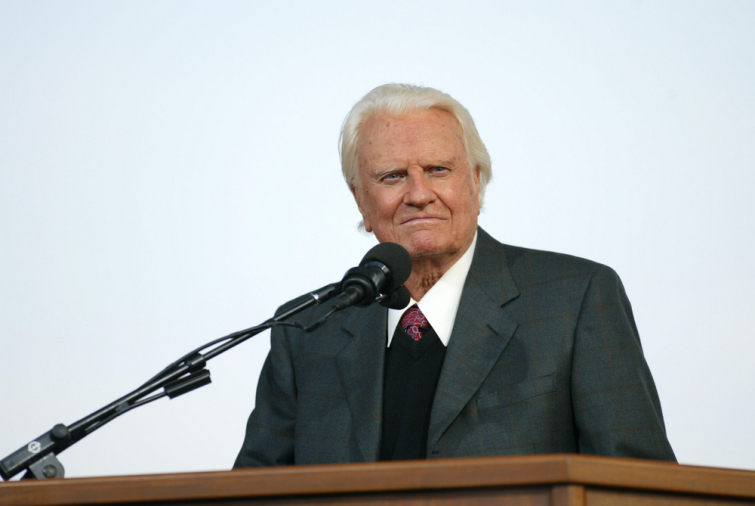 Just a few days later, on Feb. 21, Billy Graham went home to glory—and I knew it was 'Game on!'" And so Engle brought a team together of great young, evangelistic leaders: Andy Byrd of YWAM, Daniel Kolenda of Christ for All Nations, Teofilo Hayashi of Dunamis Brazil, Michael Koulianos of Jesus Image, Todd White of Lifestyle Christianity and Brian Brennt of Circuit Riders. Bolz says: "Personally, I remember being with a well-known prophet, Bob Jones, several years before he passed. We were talking about evangelism, and he told me, "When Billy Graham dies, the mantle that was on his life will cover a generation of evangelists and will bring forth a worldwide revival." As said before Engle has shifted his focus from call to send and is fixed on only one thing: "To release people to go outside the church into all the world to evangelize for a new worldwide harvest." Todd White, part of the Send's leadership team has his own ministry, Lifestyle Christianity, and just bought a campus in Dallas, Texas. "The Send is about empowering everyday people to live out and share the gospel. He says "The Send is about empowering everyday people to live out and share the gospel. What we're going after is to produce people who stand in their identity, fully realizing who they are in Christ and who Christ is in them," White says. "We are going to make sure that we are making an impact individually for the kingdom of heaven. We want to see heaven full and hell empty, and the only way for that to happen is for the body of Christ to step into its calling." Koulianos strongly believes that a new Jesus movement has already begun. "The Send is much more than a gathering," Koulianos says. "It is the anointing of Jesus the Evangelist coming upon His people. Generations, streams, and denominations are uniting under the banner of this. The 'common' Christian will take up the Great Commission to share the gospel to their world." - First, they are believing for 5,000 people at the event to sign up for missions training. - Second, they are believing that churches across the nation will go through their Send series called "The Activated Church," which teaches believers how to fruitfully engage and adopt their neighborhoods and actively impact them with the gospel. - Third, Their goal is for 1,000 campuses to be engaged in reaching their students for Jesus. "While evangelism seems to have taken a backseat among Millennial priorities, the leadership of The Send believes God will make it front and center through this powerful gathering. They hope this one day will instill this value as a primary goal for the church in America." Bolz shares his hopes.